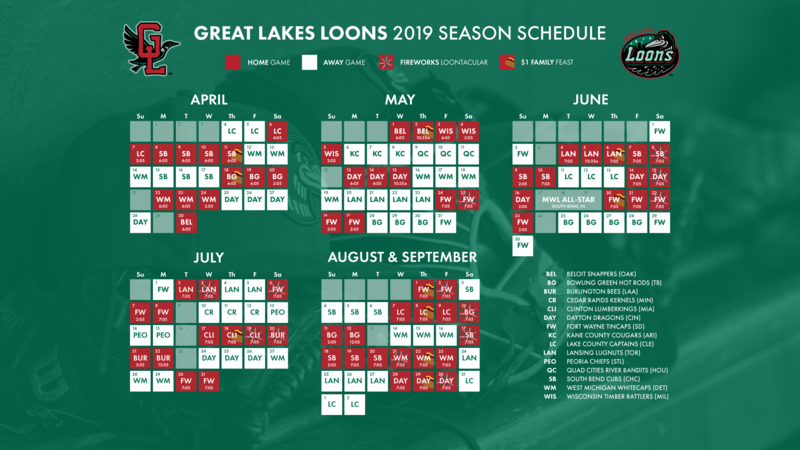 MIDLAND, Mich. - The Great Lakes Loons are pleased to announce their 2019 schedule that features 70 games at Dow Diamond. The Loons will open the season on the road against the Lake County Captains on April 4-5 before a six-game homestand from April 6-11 kicks off the home schedule. 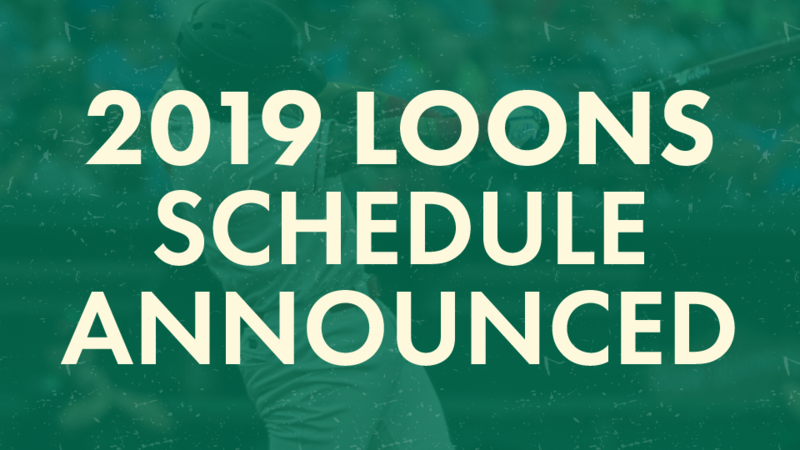 Opening Day at Dow Diamond will be Saturday, April 6, with a special game time of 4:05 p.m. April will see the Loons play 13 home games, with weekend dates having a 2:05 p.m. first pitch. The remaining games are slated for 6:05 p.m. starts. The Loons will play home games on both Memorial Day Weekend (May 24-27) and Father's Day Weekend (June 14-16) next season, both of which will include a Fireworks Loontacular. However, they will close out the season with a road series in Lake County on Labor Day Weekend. The ever-popular $1 Family Feast Night, presented by Chemical Bank, will once again take over the ballpark every Thursday home game. On those 10 dates, fans can enjoy $1 hot dogs, 16 oz. Pepsi products, Better Made chips and ice cream sandwiches throughout the game. Kids Eat Free Sundays, presented by Soaring Eagle Waterpark & Hotel, will return for another season. There will be 10 afternoon matinees offering kids 12 and under the opportunity to receive a free hot dog, chips and 16 oz. drink. Kids can also run the bases following the game on Sundays, courtesy of Farm Bureau Insurance. There are five dates currently on the 2019 schedule that have first pitch times yet to be determined: May 14, June 5, June 10, July 22, August 22. More information will follow throughout the offseason on what time those games will take place. A full promotional schedule will follow in early 2019 as Opening Day approaches.